EAGAN, Minn. — Thanks to Adam Thielen, Minnesota’s record book has already needed several revisions this year. Opposing defenses are naturally less likely to apply double coverage on Thielen when Diggs is in a pattern at the same time, as evidenced by contrast in a victory over the Lions last week. With Diggs sidelined by a rib injury, Thielen didn’t have much space. He used one of his textbook double moves to beat cornerback Nevin Lawson for a short touchdown, his seventh of the year, but he finished with only 22 yards for his lowest total since the 2016 season. “We’re always competing, we’re always having fun, and we’re always giving each a hard time if we’re not performing at the level we know we can,” Thielen said. If Thielen makes a catch in practice, Diggs will often make it a point to create even more separation from the defender the next time he’s assigned to run the same route. That, in turn, frequently triggers playful yet spirited banter between the two. At a position that has long produced some of the NFL’s biggest personalities, in some cases breeding a disruptive brand of selfish and boorish behavior, Thielen and Diggs are the anti-divas. Part of that is a product of their route, no pun intended, to the league. Thielen was the NCAA Division II player who went undrafted and needed a rookie tryout camp to make the team five years ago. He didn’t become a full-time starter until 2016. 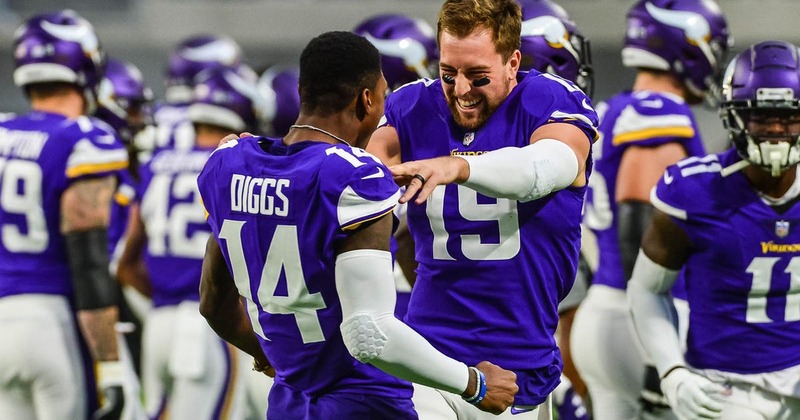 Diggs was the fifth-round draft pick who was a healthy scratch for his first three NFL games in 2015.